In the context of the current global and political structure, the question of what it means to serve our country is especially relevant. This essential reference provides a comprehensive, authoritative look at the American armed forces. Written by a well-known military historian, this two-volume set is divided into four sections, each devoted to one of the four major branches of the U.S. militarythe U.S. Army, the U.S. Navy, the U.S. Marine Corps, and the U.S. Air Force. Approximately 1,200 entries cover history; command organization; heroes and leaders; mission and role; equipment, weapons, and uniforms; life and traditions; and special terminology. Each volume is organized in an easy-to-use A-to-Z format. 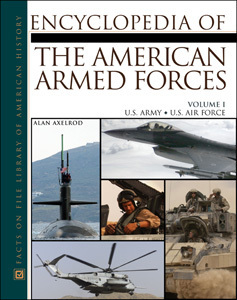 An essential reference for the study of the four branches of the American armed forces, Encyclopedia of the American Armed Forces is an invaluable reference for any high school, college, or public library, as well as a perfect addition to any personal collection. "This reference work is relevant and topical with a purpose of informing the novice on the basics of military life in today's armed forces...recommended." "An excellent recommendation for general-interest holdings." "For a thorough reference coverage of the armed forces, turn to Alan Axelrod's 2-volume set...Very highly recommended indeed: a 'must' standard reference promising lasting value." "...an important new reference on the four major branches of the US military." "Historical consultant Alan Axelrod applies personal objectivity and expert research into this easy-to-use primer and reference source." "...this is the only A–Z work on the four service branches of the U.S...The work is intended for students, researchers, military professionals, military buffs, and the general reader, and should satisfy them all. It would be a good reference source for high school, academic, and public libraries as well as for personal collections."